Botany: Vacā is a perennial plant with a creeping rhizome about the thickness of a finger, with numerous rootlets, the cortex brown to pinkish brown, the medulla white and spongy. The long, narrow sword-like leathery leaves are bright green, whitish-pink at the base, sheathing, up to 1.8 meters in length, thickened along the midrib, the other parallel veins barely visible, the margins wavy and the tip acute. The greenish-yellow flowers are small, densely packed into a sessile cylindrical spadix about 10 cm long. The entire plant has a characteristic cinnamon-like aroma. The fruits are oblong turbinate berries with a pyramidal top, mostly lacking seeds. Vacā is found throughout India in wet marshy locations up to elevations of about 1800 meters, and is similarly found in other parts of Eurasia and Africa, and has since been introduced into North America. Although A. calamus is only one of three species that are generally recognized as being members of the Acoraceae (i.e. A. calamus, A. gramineus, and recently, A. americanus), botanists have further classified A. calamus based upon the number of pairs of chromosomes (n) found in each genetic species, including hexaploid (6n), tetraploid (4n), triploid (3n) or diploid (2n). The Eurasian genetic species of A. calamus is stated as being hexaploid, tetraploid or triploid, and is infertile, only reproducing by vegetative means. Dilpoid genetic species of A. calamus, as well as the very similar A. americanus native to North America are stated to be fertile, and reproduce both by seed and rhizome (Kirtikar & Basu 1935, Larry 1973, Warrier et al 1994). Constituents: Vacā is noted for its delightfully sweet and pleasing fragrance, a feature of its essential oil, which includes a great variety of constituents including a-asarone and b-asarone, as well as elemicine, cis-isoelemecine, cis and trans eugenol and their methyl esters, camphene, p-cymene, b-gurjunene, a-selinene, b-candinene, camphor, a-terpineol, a-calacorene, azulene, calamenene, limonene, linalol, menthol, methyl-chavicol, sabinene and many others. The potentially toxic b-asarone is stated as being present in all varieties except for the diploid (2n) genetic species and the native North American (2n) species (A. americanus). Hexaploid species from Kashmir and the triploid European species,, however, can contain as little as 5-10% b-asarone, but the tetraploid species most commonly found in India can contain upwards of 75% b-asarone. In regard to the other constituents in Vacā there is little information: bitter glycosides acorin and acoretin, the flavonoid galangin, the alkaloid choline, oxalic acid, mucilage, resins and tannins (Duke 2003, Duke 1985, Kapoor 1990, Lander & Schreier 1990, Larry 1973, Vashist and Handa 1964, Williamson 2002). Toxicity: Feeding studies in rats using the volatile oil of the Asian species of A. calamus has resulted in growth inhibition, hepatic and cardiac abnormalities, serous effusion in abdominal and/or peritoneal cavities, and death (Gross et al 1967, Taylor et al 1967). The LD50 for the volatile oil of the Asian species is 777 mg/kg (rat, oral), less than 5g/kg (guinea pig, dermal), and 221 mg/kg (rat, intraperitoneal). The oil is generally considered to be non-irritating, but is reported to have caused cases of erythema and dermatitis in sensitive individuals (Opdyke 1977). Contraindications: Caution should be used with the concomitant use A. calamus with benzodiazepines, barbituates, MAO inhibitors and anticonvulsants (Opdyke 1977). 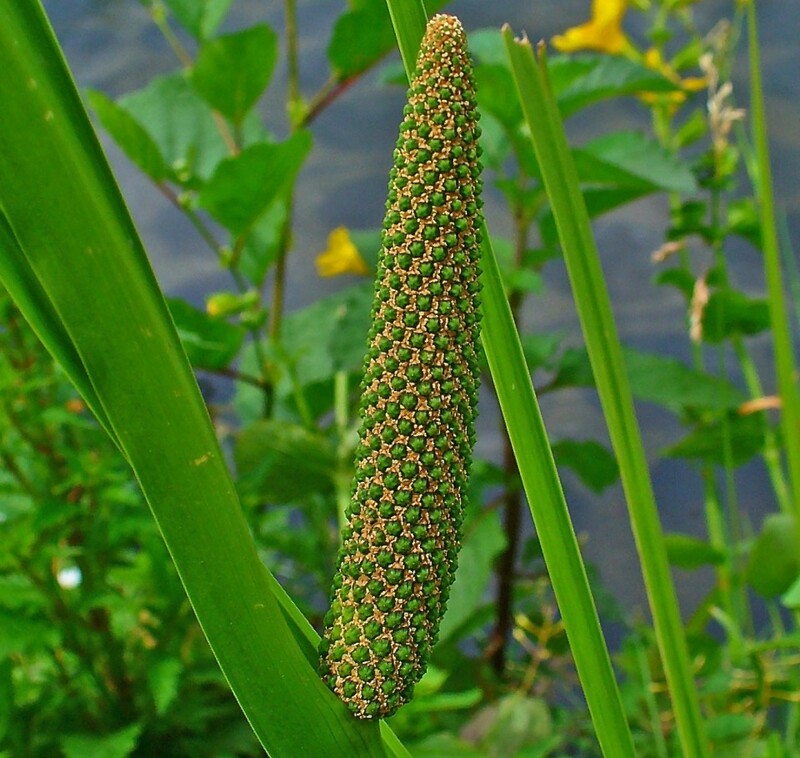 A. calamus is an emetic in large doses, and should be avoided in pre-existing cases of nausea and vomiting, and for this reason is also contraindicated in pregnancy. Care should be taken to avoid the use of the Asian (3n, 4n, 6n) species in patients with liver dysfunction due to b-asarone content (Weiss 1988). Medicinal uses: Across the world Calamus is regarded as a useful bitter-tasting aromatic stomachic, used most commonly in the treatment of disorders marked by coldness, catarrh and spasm, particularly in afflictions of the digestive tract including dyspepsia and bowel spasm. The German physician Rudolf Weiss considered Calamus to have a “powerful tonic effect on the stomach, encouraging its secretory activity,” further adding that he has “seen it used to very satisfactory effect in stomach cancer patients…for symptomatic treatment” (1988). Āyurveda too confirms the efficacy of Vacā in digestive disorders, given simply as an infusion or decoction in the treatment of dyspepsia, flatulence and diarrhea, or in complex polyherbal formulations In the treatment of kaphaja colic the Cakradatta recommends Mustādi cūrṇa, comprised of the powders of Vacā, Mustaka, Kaṭuka, Harītakī and Mūrvā (Sharma 2002). In the treatment of udāvarta, which is the upward movement of apāna vāyu causing symptoms including abdominal distension, constipation and dyspnea, the powders of one part Hiṅgu, two parts Kuṣṭha, four parts Vacā, eight parts Śaṭī, and sixteen parts Viḍa lavaṇa (black salt) are mixed with wine and taken internally (Sharma 2002). In the treatment of gulma or abdominal tumors the Cakradatta recommends Vacādya cūrṇa, comprised of equal parts Vacā, Harītakī, Hiṅgu, Amlavetasa, Yavānī, Yavakṣāra and saindhava, taken with warm water (Sharma 2002). Combined with Nimba, Haridrā, Citraka, Kaṭuka, and purified Ativiṣā, Vacā is used in kaphaja fever (Sharma 2002). Combined with Mustaka, Devadāru, purified Ativiṣā and Indrayava, Vacā is used in diarrhea produced by vāta and pitta (Sharma 2002). Combined with Pippalī, Bilva, Kuṣṭha, Citraka, Devadāru, Yaṣṭimadhu, Śatapuṣpā, Madana, Śaṭī, and Puṣkaramūla, Vacā is decocted in oil and milk until all the milk has evaporated to create a medicated oil that is taken internally in the treatment of vāttika hemorrhoids, as well as in rectal prolapse, dysentery, dysuria, lumbago and lower back weakness (Sharma 2002). Beyond its usage in digestive disorders, Vacā has other applications, taken alone or in combination with Yaṣṭimadhu in the treatment of cough, bronchitis and sore throats (Nadkarni 1954). Vacā is also used in the treatment of gout and skin diseases caused by vāta and kapha, the Cakradatta recommending a combination of equal parts Vacā, Āmalakī, Harītakī, Bibhītaka, Nimba, Mañjiṣṭhā, Kaṭuka, Guḍūcī and Dāruharidrā called Navakārṣika, used in the treatment of gout and skin diseases (Sharma 2002). In the treatment of āmavāta or inflammatory joint disease, Vacā is used in combination with Guḍūcī, Śūṇṭhī, Harītakī, Devadāru, purified Ativiṣā and Śaṭī, along with a kapha reducing diet (Sharma 2002). Other indications for Vacā include cardiac angina, anemia and jaundice. In the treatment of cardiac angina Vacā is mixed with equal parts Pippalī, Elā, Śūṇṭhī, Ajamodā, Yavakṣāra and saindhava (Sharma 2002). Decocted with Triphalā, Guḍūcī, Kaṭuka, Kirātatiktā and Nimba, Vacā is taken with honey in the treatment of anemia and jaundice (Sharma 2002). The name Vacā means ‘to speak’, referring to its usage in apasmāra (epilepsy), a condition characterized by seizure, a loss of consciousness and memory loss, allowing the patient regain the ability to ‘speak’ and regain normal consciousness. Used in nasya, the ‘strongly aromatic’ and tikṣṇa properties suggested by its synonym, Ugragandhā, makes Vacā an important traditional remedy to restore consciousness. The Caraka saṃhitā recommends Vacādya ghṛta in the treatment of epilepsy due to vitiated vāta and kapha, made simply by decocting one part coarsely ground Vacā rhizome in four parts ghṛta and eight parts water until all the water has been evaporated. The resulting preparation may be taken internally in doses of about five grams, and/or applied in nasya (Sharma & Dash 1988). In the treatment of convulsion and seizure Vacā is taken either as a powder or a decoction along with Harītakī, Rāsnā, Amlavetasa and saindhava , with ghṛta (Sharma 2002). In a similar vein, Vacā is considered to be an important remedy in unmāda, or psychosis. The Cakradatta recommends the fresh juice of Vacā, Brāhmī, Kūṣmāṇḍa, Śañkhapuṣpī and Kuṣṭha mixed with honey, and taken internally, 12-24 grams, as a specific treatment for unmāda. Combined with the powders of Haridrā, Kuṣṭha, Pippalī, Śūṇṭhī, Jīraka, Yaṣṭimadhu and saindhava, Vacā cūrṇa is also taken with ghṛta to enhance memory and remove disorders of speech (Sharma 2002). The psychotropic properties of Vacā have also been utilized in other cultures, among the First Nations people of North America for example, as well as the Moso shamans of Yunnan China, both groups using it as a spiritual aid (Gilmore 1919, Grinnell 1905, Hart 1981, Miller 1983, Smith 1973). The Bible also mentions the supernatural activities of Vacā, which was included as one of the constituents of a holy unguent that God commands Moses to rub on his body before entering the temple (Exodus 30:22-25). The hallucinogenic properties of Vacā have been attributed to a-asarone and b-asarone, precursors to 1,2,4-trimethoxy-5-propenylbenzene, a phenyethylamine that is reported to have ten times the potency of mescaline (Miller 1983). The hallucinogenic dose of the whole plant,, however, begins at about 25-30 g of the fresh rhizome, and given the aromatic pungency and potentially emetic properties of Vacā, it is a difficult dosage to attain (Miller 1983). As mentioned, the essential oil of the Asian genetic species (3n, 4n, 6n) of Vacā contains variable amounts of b-asarone, which has been shown to be carcinogenic in very large doses in experimental animals. The North American (2n) genetic species,, however, does not contain b-asarone and thus could be used as a substitute (Weiss 1988). But it is also true that excessive concern over the potential carcinogenicity of the Asian species is probably unwarranted, as Vacā has been safely used as a medicine for millennia by peoples all over the world. Nonetheless, long term consumption of the Asian species is not recommended, and should be avoided or used with caution in patients with a history of liver disease. In Chinese medicine the similar but much less fragrant A. gramineus rhizome (Shi Chang Pu) is used in much the same way as A. calamus is used in Āyurveda, to open the channels of the body, dispel phlegm and quiet the spirit. It is also stated to harmonize the middle burner, relieving symptoms of epigastric fullness caused by dampness, and is used as an analgesic remedy in joint pain and trauma caused by wind, cold and damp (Bensky & Gamble 1993). • Phāṇṭa: dried rhizome, 30-90 mL, bid-t.i.d. • Tincture: fresh rhizome 1:2, 95% alcohol; dried rhizome 1:5, 60% ethanol; 1-3 mL t.i.d.